Editor’s note: The following excerpt is from a reflection written by Fr. Richard Jones who serves as chaplain at UPMC Mercy Hospital in Pittsburgh. The reflection was distributed as part of his weekly “Fr. Rich’s Reflections” email and is reprinted here with permission. Fr. Rich is the author of four books, including The Path I Walk, Spiritual Stretches, Graces Wash Over the Sands of Time and Faith Lights the Way (information about his books is available at stjosephcatholicchurch.net -- scroll to the bottom of the page.) Retreats, like the one mentioned in Fr. Rich’s reflection, are part of the prayer life of the Sisters of the Holy Family of Nazareth. There were 12 sisters who attended the retreat: Sisters Aquinas, Noemi, Florence, Annette, Lucille, Dolores, Jane Frances, Sandy, Celeste, and Antonina along with Sisters Catherine and Florence from the Vincentian Home. Sister Antonina is the… Superior at Holy Family Manor. She is a bundle of joy and her kindness is humbling and heartwarming. Sister Aquinas is 102 years of age, and in June 2019, she is going to go kayaking! 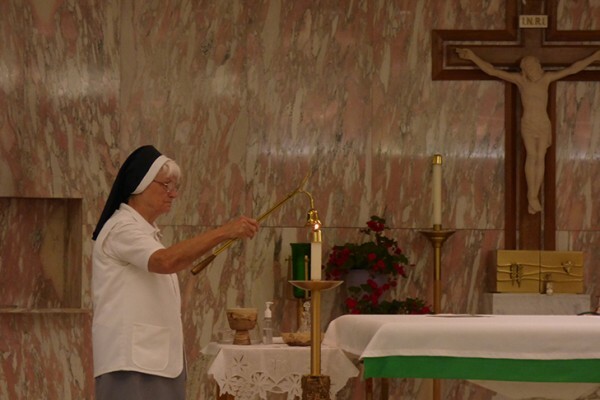 The climax of the retreat was offering the funeral Mass for Sister Mary Dominic Ciuzycki... She was called to eternal life at the age of 90 on March 22, 2019, just one day before the retreat began. She bypassed the retreat and Lent, getting a fast forward to glorious resurrection. She was born on October 24, 1928 in Detroit, MI and was in her 74th year of vowed religious life. Sister Dominic began her ministry as a Sister of the Holy Family of Nazareth ministering for over 30 years as an elementary school teacher in Michigan, Ohio, Alabama and Pennsylvania where she served as principal at St. Stanislaus School in Pittsburgh. For six years, she worked in the congregational archives in Rome and was assistant administrator in a home for the aged in Hollidaysburg, PA. She was a faithful listener with an encouraging smile; she had an optimistic attitude and a loving rapport with the other sisters, residents and staff at Holy Family Manor where she served as a receptionist for 10 years. Family and friends traveled 300 miles to Pittsburgh for the final time. They were very much aware how blessed their family was to have Sister Dominic, who dedicated her life to God and the love of His people. What a beautiful soul, full of love and faith. Spending a Lenten retreat with the Sisters of the Holy Family of Nazareth was a great way to unwind, de-stress and a special blessing for the Lenten journey 2019. It was nice to pause and drink from their spirit. I encourage everyone to join me in hitting the pause button and go the Sisters of the Holy Family of Nazareth’s website and watch the videos and read all about their mission. (https://nazarethcsfn.org/).